CityWalk Hollywood is a shopping, dining and entertainment complex located next to Universal Studios Hollywood. It's home to more than a dozen restaurants, lots of retail shops and an 18-screen movie theater. It is outside the theme park's gates and accessible to everyone. CityWalk looks like a narrow, pedestrians-only city street and a little bit like the street sets on Universal's back lot, vaguely familiar but not quite real. Overhead are colorful, brightly-lighted signs. Or as one visitor described it: "Kind of a mini-scale Vegas scene without all the booze." 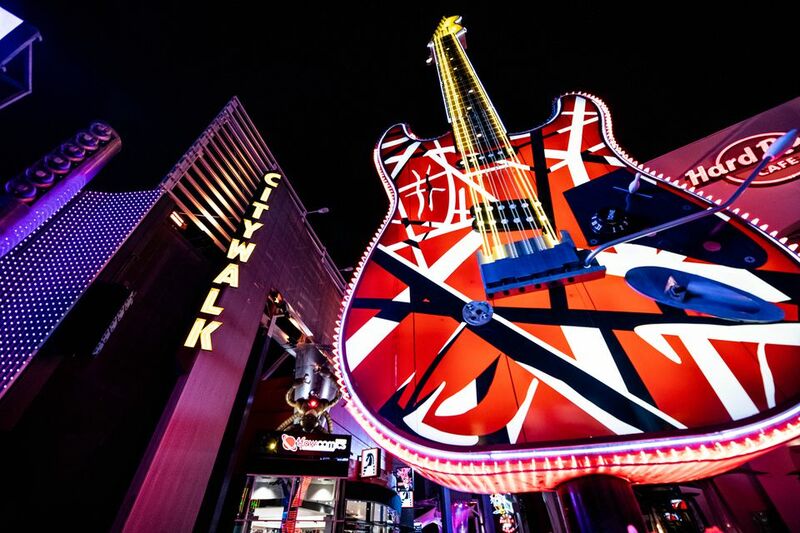 Citywalk vibrates with neon energy in the evening and at night. During the day, it's quieter but with lots of people walking to and from the theme park gates. Citywalk is the primary route between the theme park garages and its entrance, so you will probably pass through it no matter what. The question is whether it's worth your time to stop for a while - or whether you should make a trip just to see it. The three-block-long simulated city street is lined with shops of all kinds, from souvenir stops to brand-name chains. You'll also find plenty of places to eat. One of the big attractions at Universal CityWalk is the movie theatre. Universal claims that it is LA's ultimate movie experience and they may not be over-stating it. Its 18 screens include a seven-story-tall IMAX screen with dual 4K laser projection and 12 channel sound. The concession stand can provide you with a hundred different kinds of drinks (not kidding!). To watch the show, you can settle into your reserved seat in a comfy leather recliner and enjoy the show. Shopping and dining opportunities at CityWalk change frequently. Bands and other entertainers also perform at the 5 Towers live performance stage. For an up-to-date listing of concerts and everything else they have to offer, check the CityWalk website. Universal CityWalk hosts free outdoor concerts in summer, and you'll often find street performers there, too. In warm weather, kids love running through the water play area to cool off while the adults watch them and take photos. Before you go, check the CityWalk map to find out where things are located. It can save you a lot of tiring walking around. People are divided in their opinions about CityWalk. Some say it's too expensive and nothing special. Others love the people-watching, street performers, and overall energy. Locals tend to rate it lower than out-of-town visitors do. Many people would rather spend their time at Universal inside the theme park than at CityWalk. If you're one of them, find out everything you need to know about going to Universal Studios Hollywood. To find out more about what the park is like, check out the Universal Studios slideshow to see it all - without leaving your chair. If you want to take a break from the theme park and have a quiet meal in a sit-down restaurant, CityWalk is a good place to do that. It can also be a destination by itself, but it's not the only place like it in Los Angeles. Other places with a lively atmosphere, shopping, and dining include Hollywood & Highland (which has cheaper parking and a lively street scene) and Los Angeles Farmers Market and The Grove. You have to pay to park at Universal CityWalk - and it's pricey. If you go to the movies while you're there or eat at a full-service restaurant, you can get a parking discount. Otherwise, the best way to save money on that expense is to use public transportation instead. You can find directions for that below. Window-shopping and outdoor concerts are free, making it a good place to go if you're short on cash. You can get to CityWalk easily on the LA Metro Red Line, which runs from downtown through Hollywood to Universal City. From the Metro station, you can take a free shuttle or walk to CityWalk. Ridesharing services like Lyft and Uber can also be relatively inexpensive in LA and are another option for avoiding the parking hassle. In fact, depending on how far you travel they might cost less than parking would.